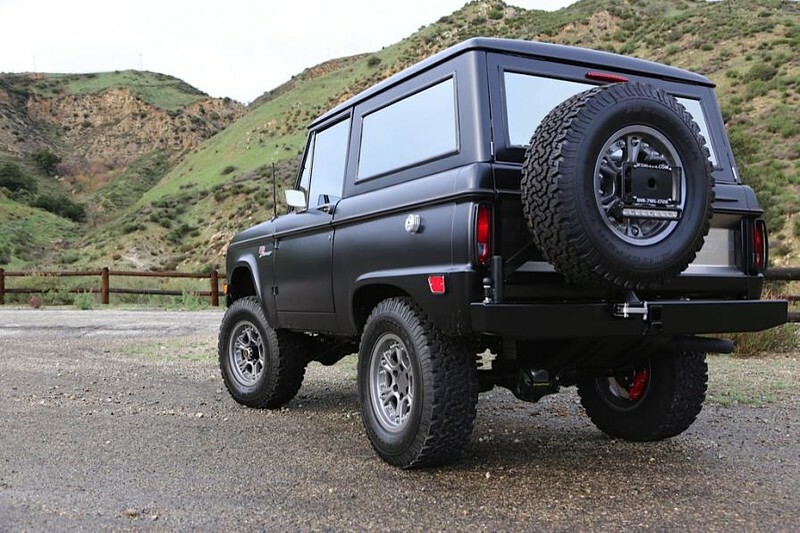 The ICON BR is a first-generation Ford Bronco on steroids. 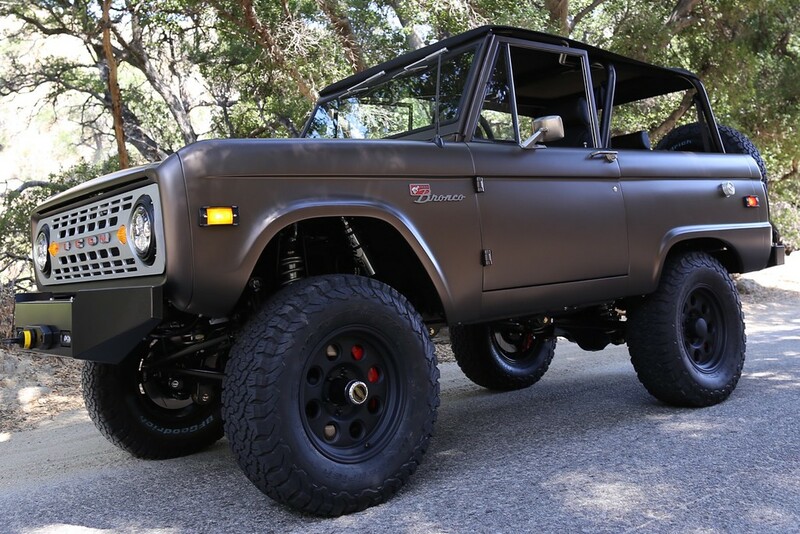 Los Angeles-based ICON takes an original uncut Bronco body off the frame, strips it down to bare metal, massages the panels into perfect alignment, adds top-quality hardware, the latest electronics, and an all-new interior, and tops it off with an eye-popping paint job. A new chassis with the latest in suspension technology and a five-liter V8 engine is slipped under the reworked body and voila, you have an ICON BR. The BR captures the spirit and essence that made the original Bronco such a favorite, yet has a vibrant presence far exceeding the original. 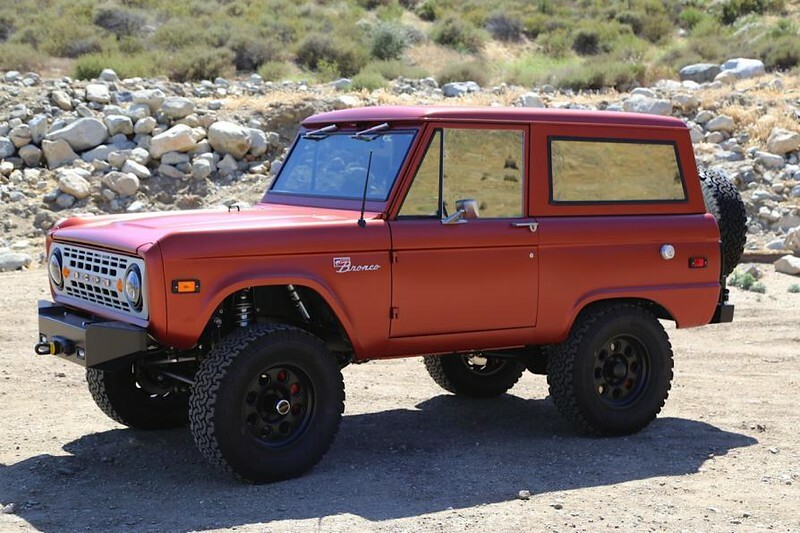 The original Ford Bronco, built between 1966 and 1977, achieved a reputation that belied its basic, simple design. Its toughness and honest go-anywhere-you-want ability, along with winner’s trophies in the Baja 1000, the Baja 500, and the Mint 400 – some of the most prestigious long-distance off-road races of the day – earned the Bronco the undying respect of hard-core off-roaders. The respect remained even after production ceased in 1977, and the original Bronco became a classic and a cult favorite. 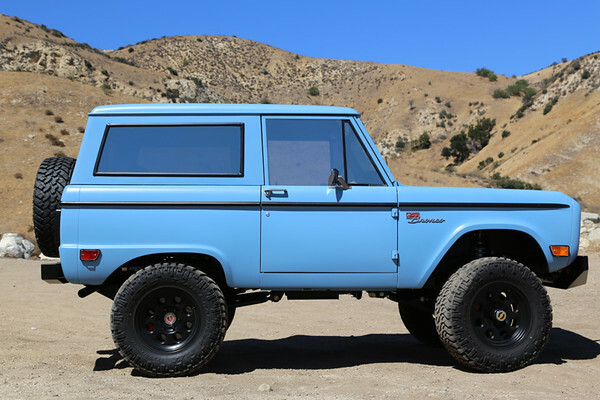 The Bronco was designed to compete against the Chevy K5 Blazer and the International Harvester Scout, basic vehicles that could tackle off-road adventures. 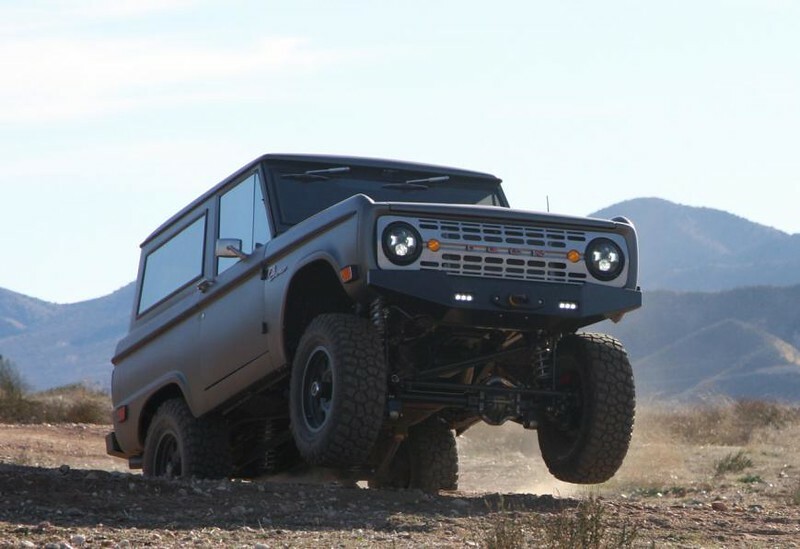 It was a relatively small market and Ford didn’t want to make a large monetary investment in the Bronco, so the design was simplified to minimize production costs. Sheet metal stampings were all straight, all of the glass was flat, and the engineering was unsophisticated. The foundation for ICON was laid by Jonathan and Jamie Ward back in 1996 when they founded TLC, a company that provides sales, service, parts, and restoration services for the Toyota Land Cruiser community. As business expanded, Toyota, asked TLC to build a few running and driving prototypes, which eventually became the 2007 FJ Cruiser. Analyzing the differences between their prototypes and the FJ Cruiser led Jonathan and Jamie to found ICON with the purpose of “reimagining” older vehicles – keeping the essence that made the vehicles beloved, yet modifying the running gear to give their owners a contemporary driving experience. 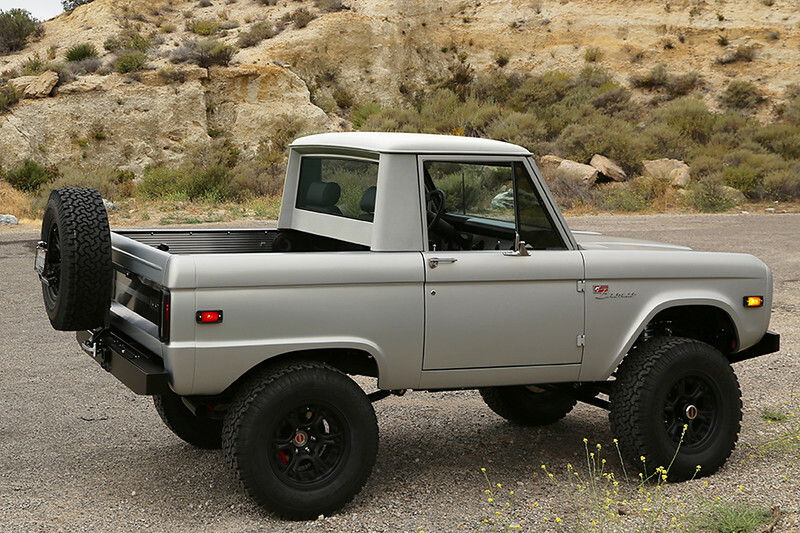 ICON started with the Toyota J40 series, then expanded its repertoire to include the classic Bronco and the Chevy Thriftmaster pickup truck. In addition to the ICON series, ICON offers the “Derelict” series, which adds modern running gear to an older vehicle while keeping the patina intact, and the “Reformer” series, which restores the vehicle body to look original while adding a modern chassis and convenience features. ICON has so far delivered 54 BRs, and there’s currently a backlog resulting in a one-year wait for a new BR. The long waiting list is even more impressive when you consider the cost of an ICON BR is between $205,000 and $240,000 – not including the cost of the vintage Bronco. And remember, prices are subject to change without notice. Every ICON BR starts with a clean 1966-1977 original Bronco that hasn’t had its rear wheel wells cut open to fit larger tires. Jonathan Ward, ICON’s founder and Chief Designer says, “We’re at the point now where we only look for Broncos wearing original paint. The repainted ones have too many hidden surprises and I don’t want the bother of fixing other people’s mistakes.” The body is separated from the chassis and ICON sells the complete rolling frame including motor, transmission, axles, and fuel system. The separated body is media blasted down to bare metal and rebuilt with new Ford-authorized replacement panels where necessary. The body is then placed in a jig and the panels aligned to make the panel gaps tighter and more uniform. Sound-suppressing Dynamat and insulation foam enhance the body, which also receives all-new, custom-fabricated hardware – door hinges are cast stainless steel; door mirrors and handles are custom CNC aluminum; the tailgate uses a custom stainless steel insert with ICON’s logo. A new dash panel includes American-made gauges from Dakota Digital and jewelry-grade dash knobs of CNC alloy, hand-engraved and enameled. A stainless steel center console with a gas-assisted lid, interior lighting, dual cup holders, and USB power ports is added. The seats and door panels are re-covered with high-quality materials (such as Chilewich fabric) and heavy-duty floor matting is installed on the floors. All the BR’s lights are LEDs, including compound LED headlights. Following the application of paint selected by the client, ICON mounts the completed body on a new, stiffer Art Morrison chassis made with 2” x 4” x 0.180” thick frame rails. The chassis has Fox Racing shocks and Eibach coil springs to allow for twelve inches of wheel travel. Stoptech brakes with 15 inch rotors and six-piston calipers in the front and 14 inch rotors with four-piston calipers at the rear provide a much-improved stopping force. An all-aluminum DOHC Ford 5.0 liter Coyote V8 engine rated at 426 horsepower at 6,500 rpm with 402 lb-ft of torque at 4,250 rpm provides the motive power. The client can choose an Aisin-Warner five-speed manual transmission or a four-speed Ford automatic. An Advance Adapters Atlas II two-speed gear-driven transfer case allows on-the-fly shifting into four-wheel drive provided by modified Dana 44 solid axles front and rear. 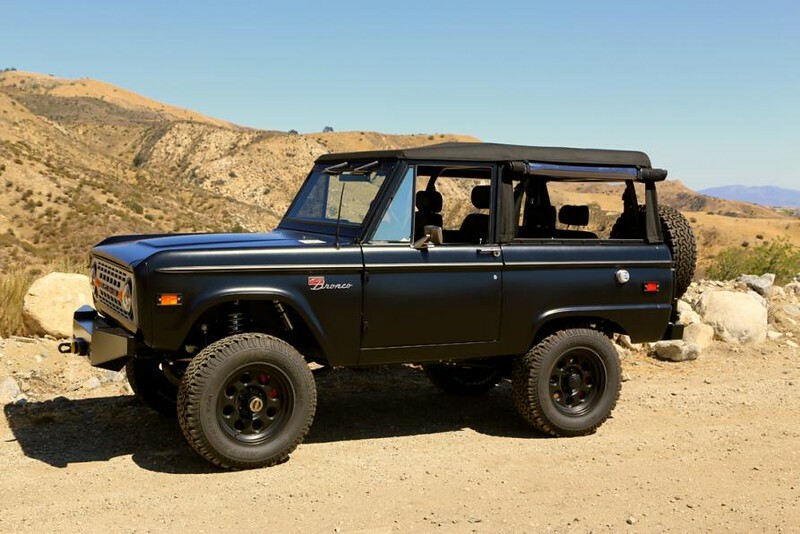 We know what you’re thinking: “Why can’t I just buy a Bronco and have it restored?” Well, you can, but the driving experience with the best restored Bronco on the planet won’t compare with driving an ICON BR. If you’re trying to relive a fun past you had with your old Bronco, you’ll be in for a disappointment. We have all become accustomed to the comfort and convenience offered by today’s vehicles and forgotten how bad cars of the sixties and seventies, including the original Bronco, really were. The seats were pretty uncomfortable for long distances; the bodies rattled, squeaked and groaned; the audio system was an AM radio and a single cheap speaker; there were no USB ports or touch screens; and servicing was required at inconveniently short intervals. An ICON BR gives you the aura of the original Bronco, plus a driving experience with all the comfort and convenience of modern vehicles. Let’s listen what clients have to say. Ford Motor Company has been teasing all of us with new Bronco concepts since 2004, but so far, none of the concepts are close to production. Back in January of 2017, Ford stoked the rumor mill at the North American International Auto Show (NAIAS) when it projected a bucking horse logo on a giant screen, with “BRONCO” in bold letters followed by “coming in 2020.” Aside from rumors, however, Ford has been very quiet on the 2020 Bronco idea. The website Gear Patrol says they were contacted by a “Ford engineer closely involved with the project” who gave them some insight as to the goings-on behind the tightly closed Ford curtain. For us big Bronco fans, not all of the goings-on were pleasant to hear, but bear in mind that this is all rumor and has not been verified. 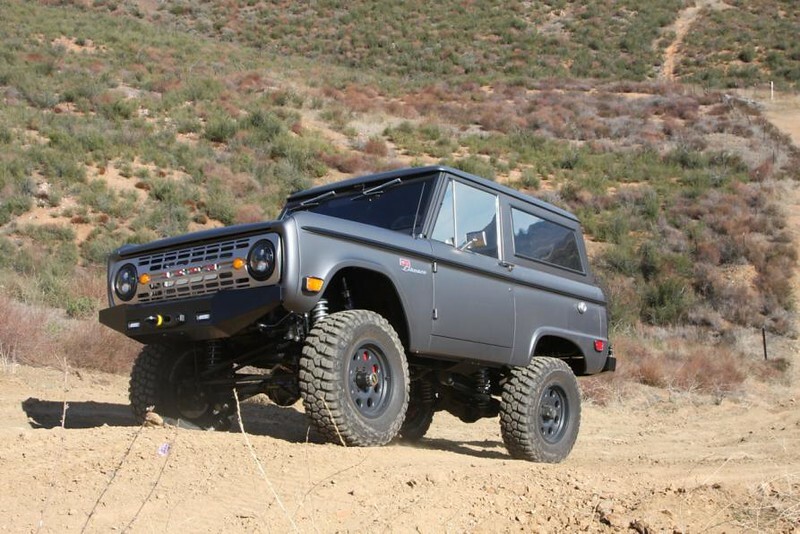 According to the ‘engineer’ opinions from all over Ford Motor Company including engineering, R&D, marketing, and management are pouring in to the Bronco project. As a result, the ‘engineer’ believes that Ford is “missing the point” of what the Bronco should be. Supporting this belief, the ‘engineer’ noted that, “They just commissioned another design study, because they feel it looks too much like a [Jeep] Wrangler.” If true, starting another design study this close to its supposed debut at the NAIAS in January of 2019, isn’t a good sign for a 2020 production date. Gear Patrol was told that there won’t be a two-door version because, “There’s just no market for it.” Another downer is that a high-performance “Raptor” version of the new Bronco, “is not even in the works yet.” Will the new Ford Bronco be just another suburbia-oriented four-door SUV without the genuine off-road capabilities of the original? Stay tuned. We’d like to thank Jonathan Ward, founder, CEO and Chief Designer at ICON for the use of his photos, video, and for promptly answering all of our email questions about ICON despite disliking having to type with his thumbs. For more details about ICON and the various models they craft, please have a look at the ICON website.